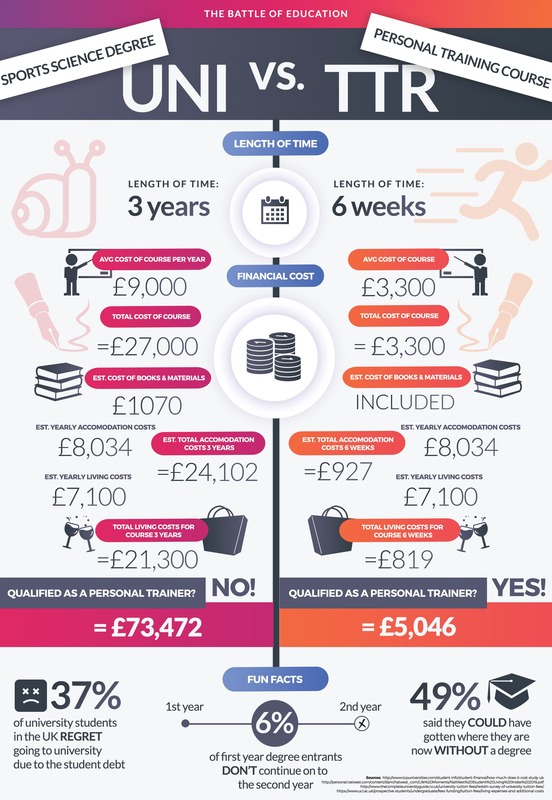 The infographic shown here aims to showcase the side by side cost comparison of attending university to that of taking part in a course here at The Training Room. While both house viable paths to professional and career development, the sacrifices made to attended university come at much higher a cost; masses of acquired student debt, so much so, that 37% of those that have attended university regret it. Additionally, as a university student, your course fees are not one off and often come with many more fees than initially considered. Varying amounts of materials, accommodation and living fees must also be factored into the crippling cost of university in addition to your yearly course fee over a three year period. On the other hand, at The Training Room we prepare you with the skillset you need to turn your passion into a viable career with a one off course fee; usually including materials and a fast track route to a career in your desired field. By substantially decreasing the lifetime of your course, taking a course at The Training Room provides you with a decrease in accommodation and living costs for the duration of the learning period. Taking a course with us at The Training Room for just six weeks is considerably different to learning and incurring costs for a full three-year period at university. Not to mention, should you choose to take out a loan for your course, the cost of the course pales in comparison to one of the three years of you spend at university.